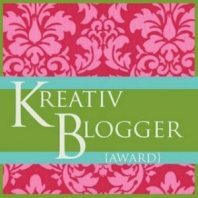 On Monday, I was surprised to learn that I had received the Kreativ Blogger Award from Patricia at Children’s Books Heal. Patricia is so thoughtful and reflective on books that she highlights on her blog. Thank you so much for this nomination. The rules for this award are to list 10 things about myself and award the blog to six other deserving bloggers. 1. I’m expecting our second son in about two months. 2. When I was in fifth grade, I memorized a list of over 40 prepositions in ABC order and can still recite them today. 3. After my first year of teaching, I decided that I really didn’t do my students justice when it came to reading instruction. So, I went back to school to become a reading specialist and my career and passion for literacy grew from there. 4. My favorite meal is from Dewey’s Pizza. The Green Lantern Pizza (Red Sauce, Light Mozzarella Cheese, Minced Garlic, Mushrooms, Goat Cheese, Artichokes, Pesto) and the House Salad are delicious. 5. I’m a National Board Certified teacher (Early Childhood Generalist). 6. In college, I worked at a children’s bookstore. It was one of my most favorite jobs. I sure do wish there were still more children’s bookstores around. 7. I taught 3rd grade in the same classroom I was in when I was a third grader. I also taught a college course in Children’s Literature in same classroom that I took the class in while working on my undergraduate degree. 8. I love to cook and follow lots of food blogs. I post our weekly menu on This Week for Dinner. 9. Someday, I hope to visit Italy. 10. When I was young, a tornado destroyed our house while we were inside. Here are my six nominations for the award. All of these blogs inspire me in some way. They are not all literacy related! You are most deserving of the award. Congratulations, as I didn’t realize you were expecting soon! You’ll soon have your hands full. I’ve never met anyone who’s lived through a tornado. It’s a miracle that you survived. I live in an area where we have frequent tornados. Your career as a teacher has been interesting. Wish there were more teachers like you who care enough to go back and learn more. It’s interesting it ignited your passion for children’s literature. Sounds like books have always been a passion, especially working in a book store.